With my frequent visits to Derriford Hospital over the past few months, I have been spending a lot of time in the hospital bus stop shelter sat waiting for a bus home. Because of the nature of his illness the last few weeks saw quite a few late nights at the hospital, and even one or two really early mornings after spending the night at the bed side. So the first thing you want to know is how long to wait for the bus home. This is the Plymouth Citybus timetable display. Its not a brilliant shot and its not even the correct timetable panel as the other shots didn't come out at all, but its the same design as the one I had to use. 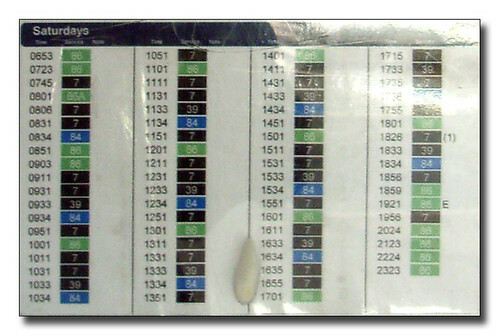 For each route served there is a list of times that the bus you want departs from that stop. Now if you know where you are going, and you know the bus route you need, then this isn't a problem. The problem comes when you don't know these things. Does this bus go to St Budeaux? if so how long does it take? There are more direct buses to St Budeaux but late at night its often better to get the first indirect bus than wait for the quicker bus. 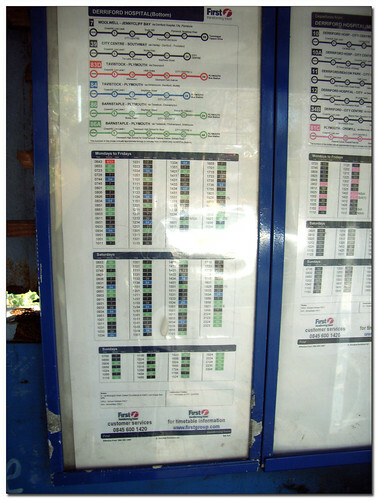 There is a large route map (dated May 2005!) in one of the shelters which does help a bit but it does not make life easy for passenger. By its very nature, Derriford Hospital gets a lot of people each day who have never been there before so have no idea of what bus to catch. You can always ask a driver of course, but most will tell you they don't know and to look up the timetables at the bus stop. This is much easier to use as you only have to look in one place to see what choice of buses you have. The colour codes then allow you make a choice (if you have one) of which bus will get you home quickest. I have been informed that the First display is produced using Omnitimes software. I dont know what Citybus use, but at my own bus stop on Keswick Cresent we have timetables like First use, albeit without the colour coding, complete with route diagrams and list of departures. Of course neither of these timetable displays is brilliant. At best you only get details of one or two stops along the way. What happens if you want to get back to Derriford? What time is the last bus back? If I get a First bus out, is there a First bus back or will I have to get a Citybus and pay two singles? This is not meant as a dig at either bus company as both are clearly trying to get the information across to passengers, many of whom just cant read simple timetables anymore. I would be interested in any comments about either of these displays. You may have got the hint from the title of this post that there is more to come on this subject. 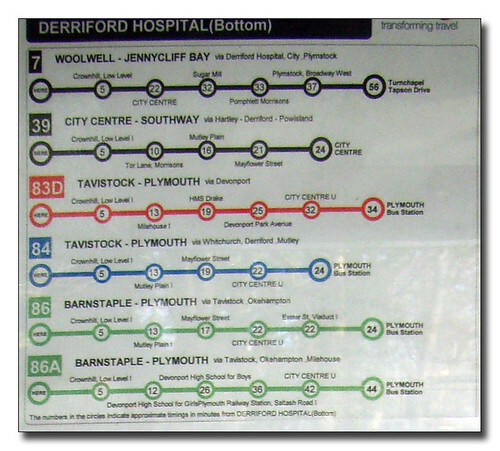 I will be looking at the Derriford bus stop in particular as it has a unique set of problems which urgently need looking at. I will also be looking at some of the improvements which are being made across the City so there is hope! Part of the problem is the number of bus stops which have to have timetable information displayed in them, (1000 plus in the City). There is an argument that the more information you include the harder it is to determine which service is best for the passenger. The majority of people using bus stops know what bus they use and just want to know when the next one will be along. Providing reams of information can have a negative effect. Although I understand your point regarding displaying the route taken by the bus, many of the timetable cases just do not have sufficient room. Fortunately in a city where many of the routes are 'high frequency' from peak to peak information on frequency is often all that the passenger requires. Out of the peak times things will always get confusing because of the reduced frequency and the complexity of some of the route variations. There is also the time and effort required to update these timetable sheets - and the labour involved. The recent changes to services which came in at the end of December have still not been communicated to every bus stop, (probably only a dozen or so left to do). This excercise needs to be repeated every time that there is a change. The City Council are currently errecting new and replacement bus stops all across the city. 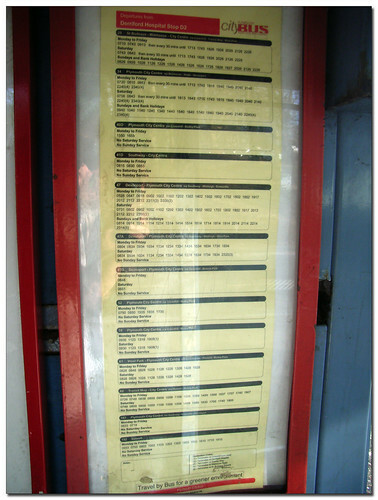 Each has a timetable case of some description, but it is down to the operators to provide the information. Perhaps the Council's transport department should undertake the task which could then show combined timetabeles where apporpriate and would save the passenger the trouble of having to firstly decide which piece of paper they need to read. There is also the ongoing vandalism of stop information. Approximately a dozen cases a day are vandalised or defaced. All of which need to be replaced. You have certainly opened up a subject for debate. It might be interesting to read what 'ordinary' passengers think. Incidentally I think both companies use a software program called 'Omnistop' which produces the information from a timetable database. Thanks Brian - always useful to hear the operators side of things! I will be following this up again shortly!